How many dozens of times a year do you sing Happy Birthday to You? 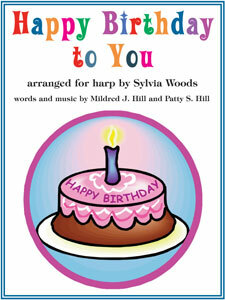 Now you can play it on your lap harp, lever harp, or pedal harp! The easy versions have a range of only 18 strings, and the early intermediate versions require 21 strings. So these arrangements will fit on most smaller harps. The key of G versions require an F-natural for the final note of the "and many more" phrase, and the key of C versions require a B-flat. These levers are pre-set in the easy and early intermediate versions. The "and many more" phrase may be omitted if you'd like. The intermediate solo versions have additional measures of arpeggios, and so they do not work if people are singing along. This is why I list them as "solo" arrangements. They require 1 lever or pedal change before the final chord. The range needed for these solo arrangements are 32 or 33 strings. Lyrics, chord symbols, and fingerings are included for each arrangement. This sheet music includes 8 pages of music and 1 page of performance notes and important information.